Students could be seen clashing with unidentified men who wielded clubs and stones. 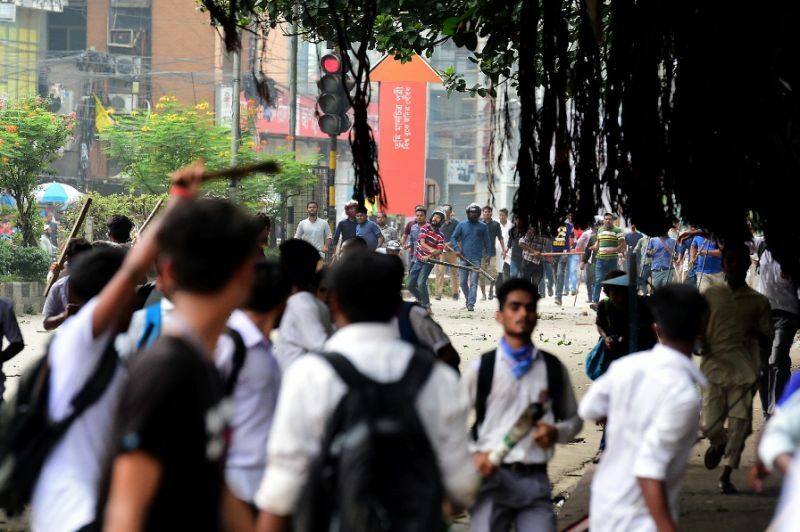 More than 100 people were injured in Bangladesh Saturday after police fired rubber bullets at students protesters, a doctor and witnesses said, a major escalation in a stand-off between the government and demonstrators. On Saturday the protests took a violent turn in Dhaka's Jigatala neighborhood. [post_ads]Witnesses said police fired rubber bullets and tear gas at demonstrators and that alleged pro-government activists attacked youngsters, including some of those rushing to nearby hospitals for treatment. "It's not true. Nothing happened at Jigatola," Dhaka police spokesman Masudur Rahman told AFP.